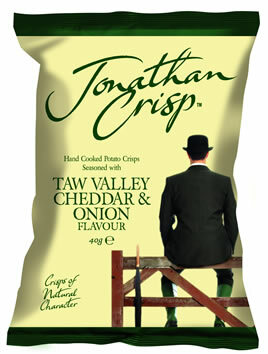 These Crisps trod the boards perfectly well between Regular Crisps and the most severely sharp and rigid of Hand Cooked Crisps. There was a nicely paced munch that led from form and hard to crunchy. There was never any mush or mash. These were medium cut Hand Cooked Crisps, with some nice boils and bubbles, plus some potato skin on edges and plentiful green spotty seasoning. A Nose Plunge Test revealed a slightly creamy Onion aroma. There was a backdrop of sweetness to a slightly dominant Onion, but there was definitely a fair proportion of Cheddar to ensure a well balanced and enjoyable version of this variety.